Kacper was 2 years old when he showed first symptoms of the disease in November 2012. It started with pain in his leg, fever, constipation, swelling and bruising around the eyes. Physicians for a few months could not diagnose the disease. Kacper, after 3 months was referred to the oncology department at Children’s Hospital in Warsaw with suspicion of cancer. Kacper was diagnosed with one of the toughest malignancies in children – neuroblastoma stage IV. Cancer spread to the bone marrow, spine, and lymph nodes. MIBG study showed massive metastatic in bones and bone marrow. Kacperwent through a very aggressivechemotreatment, after whichthere was a significantregression.The next stage ofthe treatmentwasautograftbone marrow transplantpreceded bymega chemotherapy. It was extremely hard, butit worked. Nearly two months after transplantation of hematopoietic cells, doctors allowed Kacper to leave the hospital walls. He now awaits radiotherapy and maintenance chemotherapy. Unfortunately that is where the treatment possibilities in Poland end – at the moment Poland does not have an effective method for the treatment of neuroblastoma. 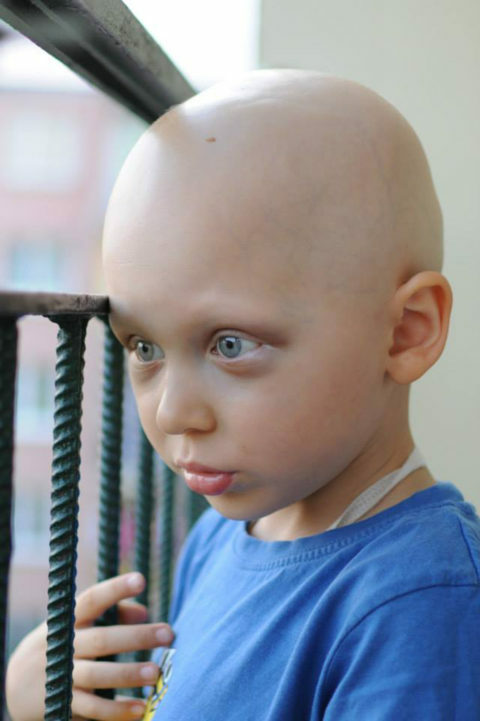 As with most cancers, the cause of neuroblastoma is unknown. Despite the use of aggressive chemotherapy relapse of the disease is enormous. A project guided by a German clinic provides treatment for children with high-risk neuroblastoma. This monoclonal anti-GD2 experimental method treats the residual disease, which in the form of “masked” cancer cells is lurking in the body of the child. The oncologists agree that residual cells almost always become active again, and then often the emaciated body of the child loses the fight. Unfortunately, the price of Kacper’s life is very high – the total cost of antibody treatment ranges between $55,000 and $195,000. Something that initially sounded like a judgment, takes on another dimension when it turns out that there’s an effective treatment for neuroblastoma available beyond Poland’s borders. This does not look like a “glimmer of hope” but rather a real rescue and a chance for further life. If you can help little Kacper, please do so today!